I can think of few better antidotes to a grey and miserable English winter than Matthew Fort's Summer in the Islands. 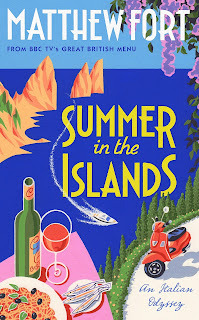 It features a food writer and TV presenter in his sixties, setting off for six months of puttering around the Italian islands on a pink Vespa, obviously bringing us the eating highlights, but much more, the enjoyment of slowing down and simply living life in a series of fascinating landscapes, rather than the everyday battling through it back home. In a puff on the back of the book, Jamie Oliver mentions the term 'midlife crisis'. Leaving aside any concerns about the definition of midlife, I'd say that Fort's adventures are the absolute antithesis of a midlife crisis. This isn't about showing off to your peers in an unsuitable sports car - it's about stepping into a different culture and gently absorbing and enjoying it. The strange thing about the enjoyment of this book is that the reader does not need any sense of wanting to be in Fort's place. Any two-wheel transport fills me with horror, and the thought of negotiating Italian roads on a scooter would be a nightmare. I may love food, but have a very limited range with seafood, and inevitably on the islands there is very little else. And few of us share Fort's ability to find himself being invited out to dinner by complete strangers. But that doesn't matter. Because we can vicariously piggyback on Fort's enjoyment, wafted along on a Mediterranean breeze and lifted by his wonderful mix of erudite observations from history and literature and visceral interaction with his surroundings. Something that comes through strongly is the difficult pull between commercial exploitation and the desperately needed cash that tourists bring. Acknowledging a degree of hypocrisy on his part, Fort can't help dislike the crowds on the beaches and the bland eateries that can spring up to support their gustatory needs - but at the same time admits that without the tourism there would be very little left on some of the islands. And he has to accept that, in the end, he too is a tourist. It's an old, old problem - but one that seems to be being played out particularly vividly on some of the islands. From his exploration of a prison island to attending an opera where three different opera companies are at war with each other, to his final magnificent destination of Venice, Fort gives us a fresh-eyed view on Italy's beautiful fringes. His lifelong love of the country and expertise in food shines through - and so does a very human viewpoint. A book to treasure.